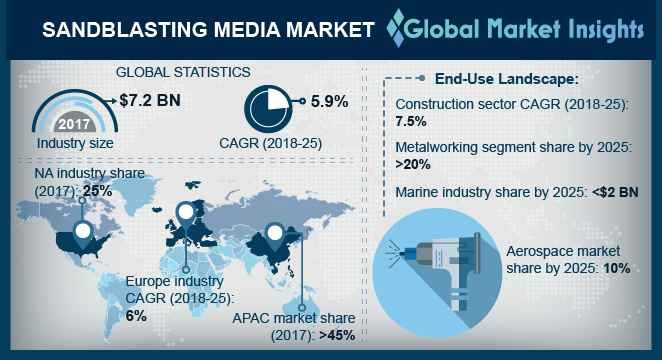 Sandblasting Media Market size will surpass USD 12 billion by 2025; according to a new research report by Global Market Insights, Inc. In an era where sustainability is predominant, industrial automation plays a key role in enhancing productivity and efficiency. This technology facilitates overall solid-waste management operations. Robotic sandblasting technology in various end-user industries such as marine, aerospace, construction, automotive, metalworking etc. will positively impact sandblasting media market consumption in the near future. Sandblast media are abrasive materials which, when combined with pressurized air or water stream are used to change the shape of the surface or remove surface contaminants. Since manual sandblasting operations are anticipated to pose potential health hazards, rising acceptance of robotic blasting methods will likely increase sandblasting abrasive industry penetration in the coming years. Waste management issues related to residual abrasive treatment, which leads to contamination of aquatic life from harmful toxic metals having lethal effect on fish and other aquatic organisms, may restrain the global sandblasting media market. Reusing, reclaiming, and recycling of the abrasives pose challenge to the end-users, increasing the operation costs, and hence hindering the market growth. One such instance of abrasive reclamation is that the residuary abrasives can be used as a raw material in production of Portland cement. With over a tenth of the industry share, aluminum oxide sandblasting media market will witness growth at a faster pace owing to its high popularity. The coal slag sandblasting media market will hold close to USD 200 million by the end of the forecast spell owing to its rising usage in the oil & gas, mining, and construction sector. Coal slag is an inert material and it is environmentally safe. It has the optimal rigidity, thickness, and particle size that provides an exceptional silica free blasting abrasive, roofing granule, and sealcoating surface material. Based on volume, metalworking segment will capture over 20% of the sandblasting media market share. The marine segment is said to poise slightly lesser than USD 2 billion by 2025 owing to huge application of the product in vessel cleaning & surface preparation, cleaning of non-metallic surfaces, removal of barnacles, removing mill scale, corrosion, casting dirt, heat treatment work piece, and reinstating paint grain pattern. The aerospace segment sandblasting media market revenue will capture a share of around 10% by the end of 2025. Considering volume, Europe, led by Germany, will exhibit growth in revenue with a CAGR of close to 6%. The North America steel shot sandblasting media market was registered at over USD 300 million in 2017 and will capture close to USD 550 million by the end of 2025. The sandblasting media market is highly fragmented due to presence of medium scale service providers. The key players are leveraging on mergers and acquisition activities to attain a dominant market share. Major players in the market includes, Saint Gobain ceramics material, ABShot Tecnics, Abrasives Inc. Barton International, Synco Industries, Blastech, Opta Minerals, Paul Auer, Naxos Diskus Schleifmittelwerke, Harsco Metals & Minerals to name some.